When Can I Retire Under FERS? In order to retire under FERS – you must have reached a certain age and have enough years of creditable service. What age? And how much creditable service? It depends on the type of retirement rules you go out under. Ex: For a regular Immediate FERS Retirement, you must have reached your Minimum Retirement Age (MRA) and have at least 30 years of creditable service. But you could also qualify if you are at least age 60 at retirement with 20 years of service, or be at least age 62 with 5 years of service. There are several different types of FERS Retirement, each with their own requirements of age and years in service. Click here to take a closer look at the different eligibility rules for FERS retirement. Sometimes people will call your FERS pension a FERS annuity. Even OPM calls it an annuity. But to avoid confusion with other annuities (ex: an annuity from TSP, or annuities from insurance companies) we’re going to be using the term pension when we talk about your FERS retirement. Every pay period, the government takes out a small portion of your pay to put towards your FERS pension. For most FERS, it is 0.8% of your basic pay. But your pension is not based on this amount. Your FERS pension is a defined benefit program. “Defined Benefit” means the amount you *get* is defined or fixed. It doesn’t matter how much money you contributed – the monthly income from your pension will be a fixed amount based on certain factors. Once you retire, you can receive a basic monthly pension for the rest of your life. How Much Will My FERS Pension Be? The calculation looks simple. But the complexity comes in how you calculate your High-3 Salary, and what really counts towards your Years of Creditable Service. Click here to learn more about how each part of your pension formula is calculated and see examples of FERS pension calculations. Once you calculate your gross pension – it’s important to look at your net number. One of the most common mistakes I see federal employees make is that they plan based on their gross pension – not on the net. They calculate their pension, but they forget to look at the amount that they’ll really ‘take home’ each month. Some will remember to factor in the cost of their FERS survivor annuity – but that’s just one reduction. There may be as many as 7 reductions to your FERS pension! Click here to learn more about the reductions to your FERS pension. Employees covered under the Federal Employee Retirement System (FERS) are typically eligible to receive Social Security benefits when they retire. Every pay period, the Federal Government takes out 6.2% of your basic pay to put towards Social Security. But just like your FERS retirement pension, your Social Security benefit is not exactly based on your contributions – it is based on other factors. The amount of Social Security you receive depends on the amount of money you’ve earned over the years and how long you have been working in a job that contributes to Social Security (most do). The easiest place to find out how much you can expect to receive in Social Security used to be your Social Security Statement. But in recent years the Social Security Administration only mails statements to workers over age 60. If you do not have a paper statement, you can view your statement online. Go to Social Security’s website. You can create a mySocialSecurity account and view your statement online. There is a special benefit for some FERS retiring before age 62. It’s called the Special Annuity Supplement, but more commonly known as the FERS Supplement. Social Security is an important part of the FERS Retirement package – but what about FERS who retire before they could even draw Social Security? The FERS Supplement is designed to help bridge the money gap for certain FERS who retire before age 62. It will supplement a portion of your missing Social Security income until you reach age 62. But not all FERS are eligible to receive the Supplement. Click here to learn more about the FERS Supplement. The Thrift Savings Plan (TSP) is a special account for Federal Employees. The TSP was created as part of the Federal Employees Retirement System in 1986. Most government employees (FERS and CSRS) are eligible for the TSP – even those hired before it was created. The TSP allows you to save pre-tax dollars in a special personal account. You can choose how to invest those dollars – although your choices are limited to the specific TSP funds. Many FERS are eligible for the TSP match – where the government and your agency contribute money to your TSP account. As you know, the FERS retirement system is complex. And while your HR department is there to help, *YOU* are responsible for your retirement. Want to receive most up to date information from Plan Your Federal Retirement? 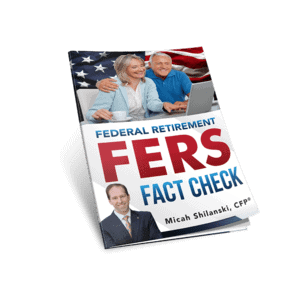 Sign up for our eZine newsletter, FERS Federal Retirement Fact Check. Each month I answer questions from Federal Employees in a new video. And if you’re on our eZine list – you can even submit your federal retirement question for a chance to have it answered in a future video. Just enter your email address and name on the sign up form on this page and click the “Subscribe” button. Then check your inbox for an email from us asking you to confirm your subscription. Once you click ‘confirm’ on that email, you’ll be on the list! Micah’s experience as financial planner for federal employees, and teaching FERS Pre-retirement classes provides him with valuable insight into the unique planning needs of federal employees. Click here to learn more about how Micah helps his clients.